One of the main steps in the development of the life in the earth is multicellularity. It enables cell differentiation and the development of morphological structures within an organism and is an essential factor in how to recognize friendly cells that are part of the multicellular organism and which foreign organisms can be harmful. Recognition includes devices such as the major histocompatibility complex (MHC), and the pattern recognition receptors (PRRs). PRRs are a group of proteins expressed by cells of the innate immune system that identify two classes of products: pathogen-associated molecular patterns (PAMPs), related to microbial pathogens, and damage-associated molecular patterns (DAMPs), associated with cell components that are released during cell damage or death. All these activate the inflammasome, which is a multiprotein oligomer that includes caspase 1, PYCARD, NALP, and caspase 5 (also known as caspase 11 or ICH-3). It is responsible for activation of inflammatory processes and has been shown to induce cell pyroptosis, a programmed cell death distinct from apoptosis, and promotes the maturation of the inflammatory cytokines interleukin 1β (IL-1β) and interleukin 18 (IL-18). We review whether inflammasome is related to diseases that can occur in the oral cavity. The mouth is always a possible environment for the development of pathological conditions because of the wide variety of microorganisms. Small variations in the equilibrium of the oral flora can cause disorders that could affect the organism in a systemic form. We provide data on periodontal disease, candidiasis, herpes virus, oral cancer, caries, and other oral diseases. 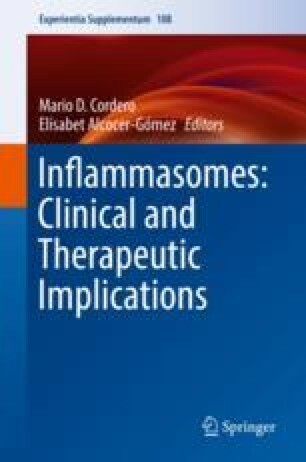 There are very few papers that study this issue; therefore, we need more investigation and publications about inflammatory molecular processes, and more specifically, related to the inflammasome complex.